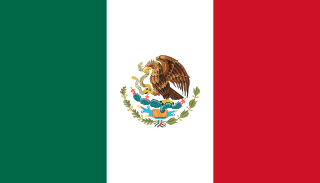 The Battle of Camarón which occurred over ten hours on 30 April 1863 between the French Foreign Legion and the Mexican army, is regarded as a defining moment in the Foreign Legion's history. A small infantry patrol, led by Captain Jean Danjou and Lieutenants Clément Maudet and Jean Vilain, numbering just 65 men was attacked and besieged by a force that may have eventually reached 3,000 Mexican infantry and cavalry, and was forced to make a defensive stand at the nearby Hacienda Camarón, in Camarón de Tejeda, Veracruz, Mexico. The conduct of the Legion, who refused to surrender, led to a certain mystique — and the battle of Camarón became synonymous with bravery and a fight-to-the-death attitude. In June 2017, the Warfare History Network declared this battle as one of the 17 greatest last stands in military history. Chalabre is a commune in the Aude department in southern France. In 1852, he transferred to the 2nd Foreign Regiment. :15 He was transferred to Algeria, to assist French colonization efforts, including the campaigns of Kabylie. :15 He lost his hand on a mapping assignment, on 1 May 1853, when his musket exploded. He designed a wooden prosthetic hand, which he used for the rest of his life. :16 Danjou was promoted to 1st lieutenant on 24 December 1853. The 2nd Foreign Infantry Regiment is an infantry regiment of the French Foreign Legion. The regiment is one of two mechanized infantry regiments of the 6th Light Armoured Brigade. As a 1st lieutenant, Danjou was part of the French army that fought in the Crimean War, and served during the Siege of Sevastopol. :15 He was promoted to captain on 9 June 1855. 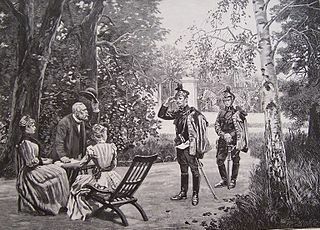 The Battle of Magenta was fought on 4 June 1859 during the Second Italian War of Independence, resulting in a French-Sardinian victory under Napoleon III against the Austrians under Marshal Ferencz Gyulai. After serving in Morocco for some time, Danjou was part of the French expeditionary corps sent to Mexico in 1862.  :15 He was the quartermaster of Colonel Jeanningros, who was in charge of the Foreign Legion regiment in Mexico. It was the duty of the French Legion to ensure the movement and safety of French supply convoys. Quartermaster is a military or naval term, the meaning of which depends on the country and service. In land armies, a quartermaster is generally a relatively senior soldier who supervises stores and distributes supplies and provisions. In many navies, a quartermaster is a non-commissioned officer rank; in some others, it is not a rank but a role related to navigation. When the Legion moved to France, Danjou's wooden hand was taken to Aubagne, where it remains in the Legion Museum of Memory. The hand is the most cherished artifact in Legion history, and the prestige and honor granted to a Legionnaire to carry it on parade in its protective case is among the greatest bestowed on a Legionnaire. 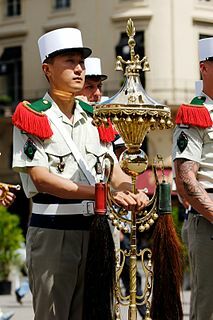 30 April is celebrated as "Camerone Day", an important day for the Legionnaires, when the wooden prosthetic hand of Capitaine Danjou is brought out for display. Captain Danjou appears in Ian Colquhoun's 2014 historical novel 'Le Boudin - The Demons of Camerone' - Colquhoun, like Danjou, is an amputee. The 1st Foreign Regiment and the 2nd Foreign are the original and most senior founding regiments of the French Foreign Legion. The 2nd Foreign Engineer Regiment is one of two combat engineer regiments in the French Foreign Legion. The regiment provides the combat engineering component of the 27th Mountain Infantry Brigade. Stationed, since its creation in 1999, on the former site of the French Strategic Nuclear Missiles at Saint Christol, Vaucluse, southern France. The 13th Demi-Brigade of Foreign Legion, was created in 1940 and was the main unit of the 1st Free French Division, Free French Forces (FFL). From the coast of Norway to Bir Hakeim, to Africa then the Alsace, while passing by Syria and Italy, the 13th Demi-Brigade would be part of most of the major campaigns of the armed forces of France during the Second World War. The French Foreign Legion has had a long and unique history amongst the units of the French Army. The French Foreign Legion was historically formed of expatriate enlisted personnel led by French officers. Founded by a royal ordinance issued by King Louis Philippe of France on March 9, 1831 with aim of bolstering the strength of the French Army while also finding a use for the influx of refugees inundating France at the time. The Foreign Legion subsequently found a permanent home in the ranks of the French military. The Foreign Legion's history spans across Conquest of Algeria, the Franco-Prussian War, numerous colonial exploits, both World Wars, the First Indochina War, and the Algerian War. Pierre Paul Jeanpierre was a senior officer of the French Foreign Legion. The 1st Foreign Parachute Regiment was an airborne regiment of the French Foreign Legion which dated its origins to 1948. 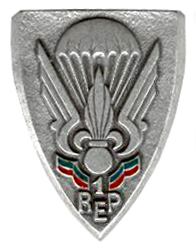 The regiment fought in the First Indochina War as the three-time reconstituted 1st Foreign Parachute Battalion, the Suez Crisis and Algerian War, but was dissolved along with the 10th Parachute Division and 25th Parachute Division following the generals' putsch against part of the French government in 1961. The Tonkin Expeditionary Corps was an important French military command based in northern Vietnam (Tonkin) from June 1883 to April 1886. The expeditionary corps fought the Tonkin Campaign (1883–86) taking part in campaigns against the Black Flag Army and the Chinese Yunnan and Guangxi Armies during the Sino-French War and the period of undeclared hostilities that preceded it, and in important operations against Vietnamese guerrilla bands during the subsequent 'Pacification of Tonkin'. Raoul Charles Magrin-Vernerey, other known as Ralph Monclar born 7 February 1892, was a French officer and 2nd Inspector of the Foreign Legion who fought in World War I, World War II within the ranks of the Free French Forces and led the French Battalion in the Korean War. He was also one of the first senior officers to respond to the Appeal of 18 June. The French Foreign Legion Museum situated in Aubagne, France, represents the history and "arms history" accomplishments of the French Foreign Legion throughout the course of various collections and expositions. The museum welcomes numerous visitors, as well as scholars and temporary expositions. Institution des Invalides de la Legion Etrangere is one of various detachments reserved exclusively for personnel having served in the French Foreign Legion and for the most part, is also serviced by veteran legionnaires. The detachment's main activity is focused on housing and caring for over a hundred veteran legionnaires, which include wounded legionnaires, retired legionnaires and the elder legionnaires. Amongst the detachment's various functions, the primary mission revolves around being exclusively dedicated, specially to comfort the senior wounded veterans of the Legion which are housed in this institution. The domain is 240 hectares situated on the slope of the Montagne Sainte-Victoire in the south of France on the commune of Puyloubier. The institute is dependent on the Foyer d'entreaide de la étrangère, a public administration established in 2014. The Garibaldi Legion was a unit of the French Foreign Legion which formed the Marching Regiment of the Foreign Legion composed entirely all of Italian citizens, who fought in France in World War I against the Germans. The Pioneers of the French Foreign Legion are a "unit of tradition". They march at the head of Foreign Legion detachments during ceremonial parades. The Legion's Pioneers are bearded, wear buffalo leather aprons, and carry polished axes on their shoulders. The Marching Regimentof the French Foreign Legion (RMLE) was a French military unit that fought in World War I and World War II. 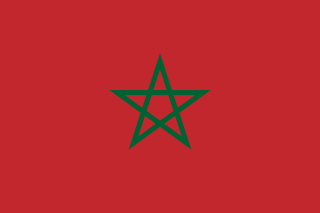 Initially composed of marching regiments from the 1st Foreign Regiment of Sidi Bel Abbes and the 2nd Foreign Infantry Regiment of Saida, Algeria, it re-formed as the 3rd Foreign Infantry Regiment. Francisco de Paula Milán was an officier of the Mexican Army from the Liberals group, that fought in the service of Benito Juárez. Roger "René" Faulques was a French Army Colonel, a graduate of the École spéciale militaire de Saint-Cyr, and a paratrooper officer of the French Foreign Legion. The French Foreign Legion is an elite force composed of soldiers of different race, trade, religion, and sentiments, which began as part of the French Army. Through the years, it has earned a quasi-legendary reputation due to its victories and also its gallant defeats. It was founded in 1831 and was given the right to hire foreign recruits. 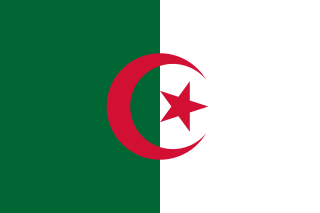 The Foreign Legion was deeply rooted in the French conquest of Algeria. Since its inception, the Legion played an important role in advancing France's colonial expansion.